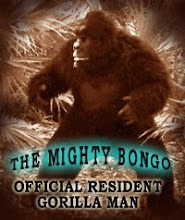 Poor Konga, grown from a little chimp to a giant gorilla monster only to be blasted with bullets....Lucky ape ! Our friend George Chastain, alerted us to this treasure he unearthed while digging around Internet auction sites. 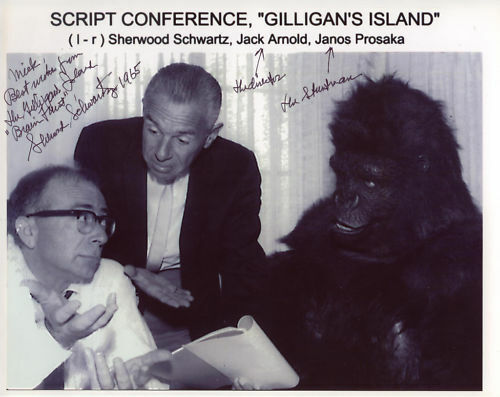 It's an autographed promo card for Gilligans Island signed by executive producer Sherwood Schwartz. 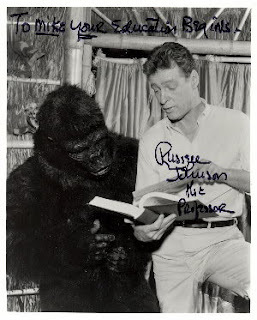 Schwartz wrote in under Jack Arnolds name"the director" and under Janos Prohaskas name( miss-spelled here as Prosaka) Schwartz wrote"the stuntman". The classic Gilligans Island was one of the must see programs for the kids of the 60's and 70's. 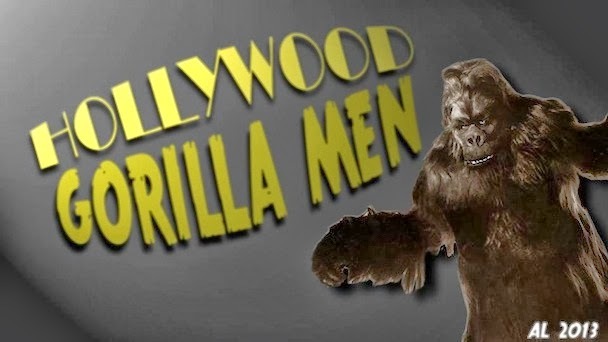 As an aspiring young gorilla man, I would watch the show partially in hopes to see a gorilla...when I wasn't busy looking at Mary Ann that is. 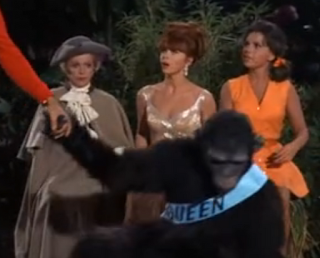 Gilligan had many run ins with problematic primates during the run of the show, Chimpanzees, bomb throwing monkeys, orangutans and our friendly neighborhood gorilla men. 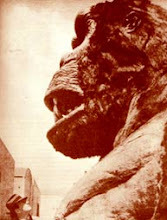 While the chimps and monkeys were played by the real thing, the upper order primate jobs went to none other than Janos Prohaska. 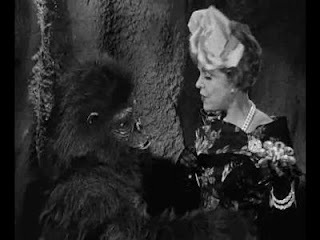 Janos' story lines usually centered around Mary Ann or Ginger being captured by an ape, and needing to be rescued by the castaways, though Gilligan occasionally found himself to be the romantic interest of the menacing monkeys. Janos showed a keen sense of humor in these gigs, and at times out shined the main cast. 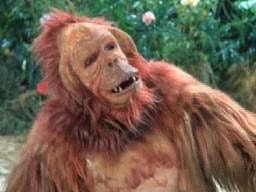 While Prohaskas gorillas were fairly commonplace to TV audiences, his orangutan was a nice addition to Gilligans monkey menagerie. Prohaskas chimp outfit also made an appearance or two. 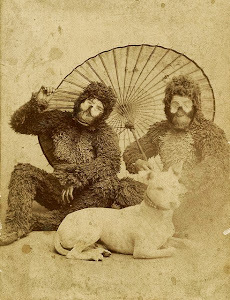 So join us now , right here my friend, and your sure to get a smile...From the hairy Hungarian monkey man, here on Gorilligans Isle !